I'm sharing this with the hopes that it will help somebody else or possibly prevent an accident. So I've owned my evo 8 for about 6 years at this point. Autocrossed it many times. Taken good care of it, upgraded it, only ever used the best parts. This car has had the good life. It's been good to me, very resilient platform. With that said, something happened recently that had me seriously scratching my head until I figured out what was going on. I drive the car only seldomly so as to take better care of it. So I'm out driving one day (months ago) and when I was nearly home I punched it on a straight away as hard as I could (as one would do with an evo) and as soon as I did I felt a violent pull to the left. Being the first time I thought it was just weird. Looked around, nothing suspicious, perhaps a fluke. It was driving perfectly fine even on the highway, it just did that when I really hit it. I thought to myself, maybe, as many times as I have autocrossed this thing something must just be worn out somewhere. So each of the next few times I drove the car, every time I would attempt to go under heavy acceleration, I would feel it pulling hard to the left. I eventually put the car on a rack. I checked everything, or so I thought. Tie rods were good, links were good, control arms seemed fine, all bushings fine, nothing obvious or broken or bent. Checked the axles, all normal. Again, I would drive the thing, and it would pull like crazy under acceleration. 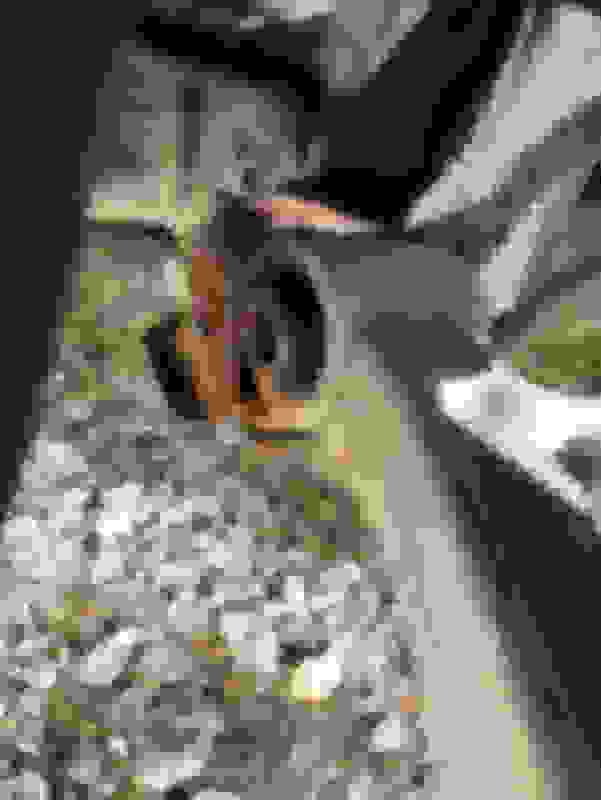 Kept playing with it, put it back up in the air, grabbed the entire tire and pulled back and forth on it to see if somehow the entire wheel assembly was loose, but it wasn't at all. At this point I'm really reaching for an explanation lol. So one night, after driving down the highway at 70+ mph to work, I stopped off to grab some food. I pull into the parking lot and before I get to the speaker I hear the loudest most awful CLINK! sound you've ever heard and my car comes to an abrupt stop on its own. Stuck in a drive through lane. I thought for sure, for some reason, my transmission just ate it. I have a friend who tows, and he came and picked the car up and took it home. I take the wheels off the front, and eventually find what you see in the picture, the control arm completely separated from the cradle that it sits in. I'm pretty lucky it decided to wait until I was in a parking lot going 5 mph before it fell apart. This is why the car was pulling to the left so hard, that bolt was half way out the whole time it was doing that. Eventually the bolt worked itself all the way out and slam! Down goes the car. You can't see in the picture, but inside that cradle there is a nut welded in there from the factory (I'm assuming). It's part of the body. That control arm fits inside that cradle and then a bolt slips in until it hits threads and then it tightens down. Somehow, a crack happened/formed inside that cradle near the bolt hole and the bolt hole itself cracked as well and the bolt slipped out. When I had it all taken apart, using another factory bolt I ordered, I could slip it in and out of that hole without it catching the threads. The nut welded inside the cradle was done for. If I had known where to look, I could have seen the crack from the bottom, but it went undetected. This was a first. Now I know. Last edited by Stark_Tech; Jan 2, 2019 at 01:02 AM. Didnt Mitsubishi have a recall for the subframe corroding? Yup, the K frame does have a recall on it if the rust is bad enough. Mitsubishi is only replacing the really bad ones though, this could qualify. OP, Glad you found the issue, posted about it, and fixed it. It could have been really bad if left alone. I'm surprised you didn't catch it earlier though. 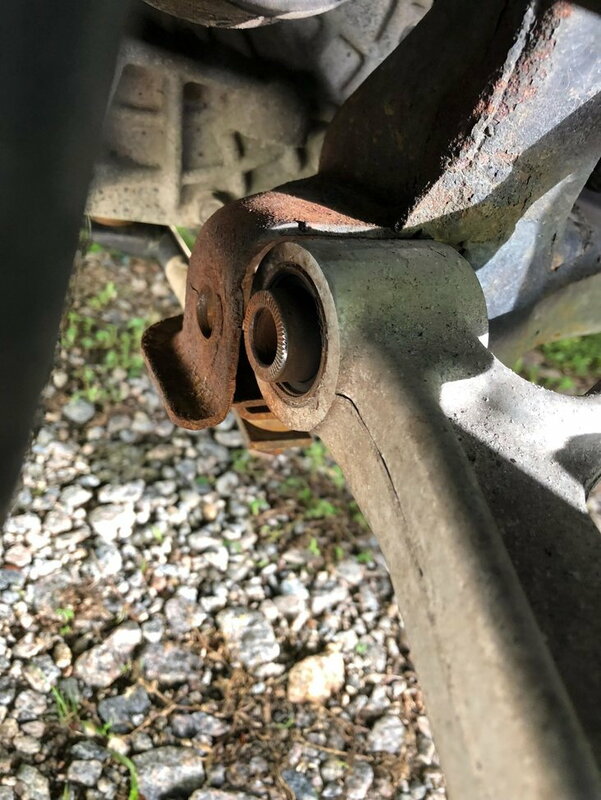 It seems like lower control arm bolts and suspension components are the first things one would check for looseness when a car steers violently to the left.